Who Holds the Reins on Federal Law Enforcement? In this new report policing expert Randy Petersen outlines the conservative case for policing reforms. Having spent 21 years in law enforcement, Petersen introduces four recommended areas for reform. These areas are police militarization, their place in the community, hiring and training, and lawmaking. This report recommends that in order to better support law enforcement, we must continuously examine their practices so that we can provide the policies, training, and equipment they need to protect communities. 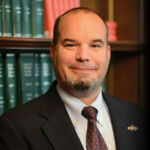 RANDY PETERSEN is a senior researcher for Right on Crime and the Center for Effective Justice at the Texas Public Policy Foundation. Petersen spent twenty-one years in law enforcement in Bloomingdale, Illinois, working in patrol, investigations, administration, and management. After retiring from the Bloomingdale Police Department, Randy moved to Texas where he was an instructor and Director of the Tarrant County College District Criminal Justice Training Center, of one of the largest police academies in the state. The academy was responsible for basic police training for over forty different police agencies in the DFW Metroplex as well as in-service training for current law enforcement officers from all over the country. Randy is passionate about law enforcement and criminal justice policy issues and is pursuing his Doctor of Management in Homeland Security. His research specialties include the militarization of law enforcement, police training, and police assisted diversion programs. Randy holds a B.S. in Legal Studies and a M.S. in Justice Administration and Crime Management from Bellevue University. His free time is spent with his wife, kids, and horses.